1. How to register Sidify Apple Music Converter for Windows? 2. What to do when get the message shows invalid code? 3. Why can I only convert the first 3 minutes of each audio? 4. What kinds of music does Sidify Apple Music Converter support converting? 5. What output format can Sidify Apple Music Converter export? 6. How to fix the problem that only seeing a fraction of the iTunes library in Sidify? 7. Does it work with the new iTunes download from Windows 10 Store? 8. How to improve the output quality? 9. How to fix the problem that the output files have several short breaks of silence when played back? 10. How to solve the problem of "Conversion Failed" when converting iTunes music with Sidify? 11. How to automatically store the output audio into Artist / Album folders? 12. Whether the metadata can be kept after conversion? 12. How to fix the problem that the output MP3 files don't have sound? 13. I encounter some problems that I can't find in FAQ. How can I get technical support? How to register Sidify Apple Music Converter for Windows? Launch Sidfy Apple Music Converter for Windows. Click the top-right "Menu" button and choose "Register" in the drop-down list, you will get the registration window. Copy and paste the Email address and Code into the registration pop-up dialog. Note: The registration code is case sensitive, please do not add blank at the beginning or the end of the word. What to do when get the message shows invalid code? First, the registration code doesn't match the program. Please make sure you have downloaded the right program. Second, blank spaces are accidentally added while filling in the registration information. Please mind that license information is case-sensitive. Do not enter any extra blank space to the E-mail address or license code. If you're sure that you are running the right program and follow the direction but still get the error message, please contact our support team via support@sidify.com for help. Important Notes: For old users who purchased Sdifiy Apple Music Converter for Windows before Sep. 22nd, 2016, they should register the program with registration name and registration code. It's the limitation of trial version. You can buy full version to unlock the 3-minute conversion limitation. What kinds of music does Sidify Apple Music Converter support converting? Sidify Apple Music Converter can convert any audio that can be played in iTunes. Audio like Apple Music songs, iTunes audiobooks, iTunes M4P music and Audible audiobooks can be converted. What output format can Sidify Apple Music Converter export? Now, Sidify Apple Music Converter can convert audio files to MP3, M4A, M4B, WAV and FLAC format. How to fix the problem that only seeing a fraction of the iTunes library in Sidify? Please make sure you've well downloaded all your music from iTunes to your computer and your computer is well authorized with the same Apple ID that you used when downloading the iTunes music. b. Go to C:\Users\username\Music\iTunes and delete "iTunes Music Library.xml"
Now close iTunes and start Sidify to check whether the issue can be fixed. Does it work with the new iTunes download from Windows 10 Store? Yes, Sidify Apple Music Converter is fully compatible with the iTunes downloaded from Windows 10 store. To convert Apple Music smoothly, you can download or update Sidify Apple Music Converter to the latest version. How to improve the output quality? Please try to slow down the conversion speed to 1X for a try if your network is unstable. If you are still unsatisfied with the output quality after adjusted the settings, please contact us at support@sidify.com for further help. How to fix the problem that the output files have several short breaks of silence when played back? Please disable the Crossfade Songs in iTunes > Preferences > Playback. How to solve the problem of "Conversion Failed" when converting iTunes music with Sidify? 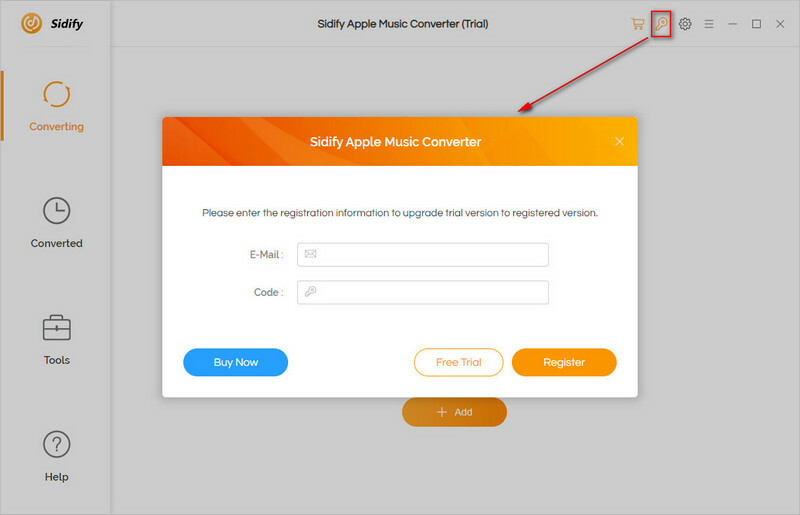 At first, please make sure you are running the latest version of Sidify program, otherwise please directly download the latest version of Sidify Apple Music Converter through Sidify Download Center. Please make sure your original audio can be played on iTunes normally. -- If it is a purchased M4P music from iTunes, please make sure your computer is well authorized with the same Apple ID that you used when downloading the iTunes music. Please check whether the problem happen to certain music files or not. If it is, please re-convert the music for a try. Please check whether is there any external audio device connected with your computer including USB, Wi-Fi, Airplay, Bluetooth and HDMI, etc. If it is, please disconnect them and retry. After clicking "Convert", please open iTunes window and check whether is there any pop-up blocking message (such as download, authorization, update...). If it is, please resolve them and retry. How to automatically store the output audio into Artist / Album folders? Before converting, please click the setting button on the top-right corner, and then check the box of the "Artist/ Album" after Output Organized. 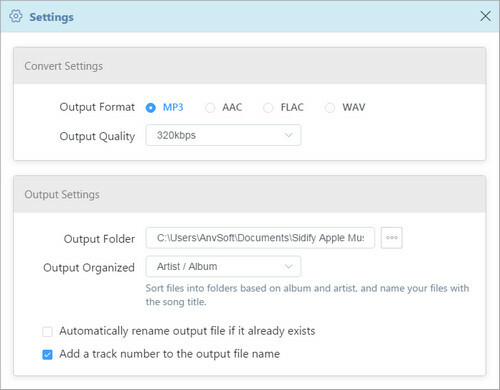 Now, Sidify program supports saving the output audio into Artist, Album, Artist/Album or Album/Artist folder for meeting various users needs. Whether the metadata can be kept after conversion? When choosing MP3 or AAC as output format, all the metadata info (including title, artist, album, year, track number and genre) will be kept by default. 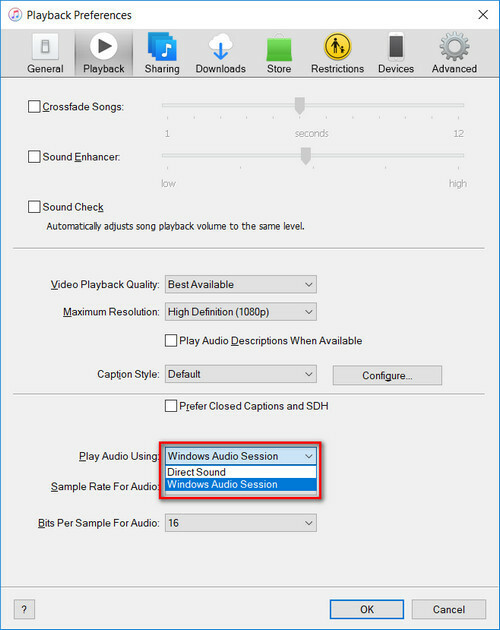 How to fix the problem that the output MP3 files don't have sound? Please open iTunes Preferences by clicking "Edit > Preferences" and choose the "Playback", then select "Windows Audio Session" from the drop-down list of "Play Audio Using" and click "OK". After that, close iTunes and launch Sidify program to convert those songs again. I encounter some problems that I can't find in FAQ. How can I get technical support? Please contact our support team via support@sidify.com, tell us which problem are you encountering and provide us with detailed info like Windows OS, iTunes version, and Sidify log files for analysis. a. Which Windows OS are you using? 32 bits or 64 bits? And your iTunes version? b. What kind of audio are you converting? Apple Music? DRM-ed audiobooks? iTunes M4P song or ordinary audio files? c. What is the output format and setting you choose? d. Does the problem happen to certain audio file or to all the audio files? e. Please send us two log files: you can find them by going to the program, Menu > Open Log File. They are called application.log and convert.log.